A few days before Thanksgiving, I did get a call from the friend I had hosted for many years, inquiring if perhaps we could get together for Thanksgiving at a restaurant … and by the way, would The Child and I like to come over for Christmas like we used to? It was nice to be remembered, and invited, and made the day seem more holiday-ish, but in the end, though we thought we might join her for Christmas, The Child and I decided to stick with our original Thanksgiving plan: Watch bad movies all day, listen to Christmas music, and decorate for Christmas. We started on Wednesday night, and it turned out there wasn’t much for me to do, except let her know where things might be stashed. The Christmas Village? Check the laundry room. The most helpful thing I could do was offer dinner, and though I fearfully expected this would lead to a dark, rainy drive to her favorite burrito place, she had holidays on her mind, and wanted latkes. Never mind that when I made latkes for Hanukah last year, she didn’t like them. This year, they are all she wants. It seems like I should have an old family recipe for latkes handed down from my Jewish grandmother, but I don’t, and in fact if my Jewish grandmother ever cooked latkes for me, I have no recollection of it. So I google, and quickly discover there are far too many latke recipes on the internet to sort through (about a zillion, give or take). I restrict my search to the Fine Cooking website, which also has an abundant number of recipes, but at least the numbers are reduced enough that there’s a chance I can evaluate them all and choose the best one. Then I made the second recipe that came up on the search results, because I made the first recipe on the list last year. The Child pronounced them delicious and proceeded to devour them while sitting at the table and researching which of her favorite stores would have the best Black Friday deals. Last year you put in too much onion, she said. These are perfect. It’s always a good day when you’ve managed to fix something even though you had no idea what was wrong with it in the first place. But since the ratio of onion to potato is the same in both recipes, I decide to simply accept the compliment. With dinner done, The Child resumed her decorating, and I thought that it would be nice to make some breakfast treats for Thanksgiving morning. I used to get frozen cinnamon rolls at Costco for Christmas, but this time, I would do better: I would make my own. I didn’t want cinnamon, though; instead, I wanted lemon, partly because lemon rolls sound lovely and partly because I have a bag of lemons in the fridge that are right on the edge, that I want to use up. A bit of searching yielded some recipes, including this one by the Pioneer Woman. I made the dough on Wednesday evening, and finished the recipe Thursday morning. This is probably a good time to mention that until I attempted this recipe, the only thing I knew about the Pioneer Woman is this: Every so often someone I know posts something from PW’s website on Facebook, which is typically followed by a bunch of comments about how awesome she is. 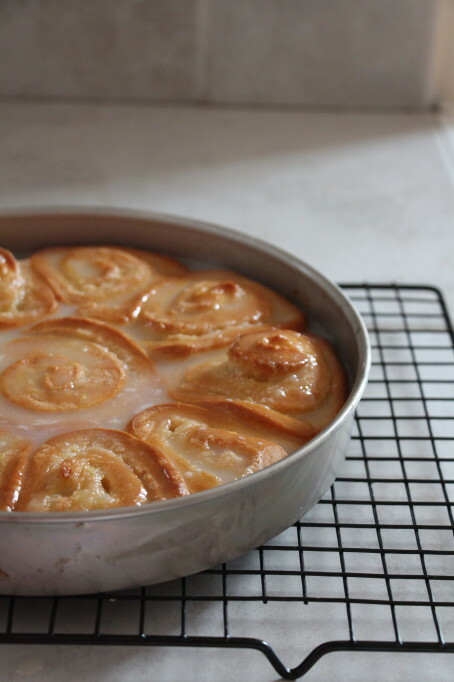 Lemon rolls from a popular food blogger: Seems safe. My first clue that something was amiss was this: the instructions for the dough make enough for two batches of rolls, but only one is used. This would be fine, but no explanation is given for why we’re making all the extra, or what to do it. Does it freeze? Do I need to make more rolls ASAP? I decided to avoid answering these questions and simply divide the recipe by two, and this is where I found myself questioning the Pioneer Woman’s recipe testing. Why didn’t she just divide it to begin with? There was nothing difficult about dividing the ingredients in two, no pesky “three eggs” to throw things off. Every quantity listed was easily divisible by two. Try it. It’s simple math. If there’s a rule about whether you should end up with the long or short side nearest you after rolling out dough, I don’t know it, so I look for clues elsewhere in the recipe. This involves more math, and I’m sorry about that. Here you thought you were getting a lemon roll recipe, and instead you’re getting a math test. Here’s the problem: The recipe says it makes 24 rolls. The recipe also instructs the cook to cut the rolled-up dough into half-inch slices. How do you roll a piece of 30×10 inch dough to achieve a log that can be cut into 24 half-inch slices? In case you’re not good at math, there are two possible outcomes for people who follow the directions as written: they will have 60 rolls, or they will have 20 rolls. I guess in theory you could roll it on an angle, but the recipe doesn’t say to do that, or mention starting with a pointy corner, and my geometry skills are too rusty to figure this one out. I decide to go with rolling the dough into a 30-inch log, which may be why I also needed three pie pans to bake my rolls in – though I’m hard pressed to see how you could slice the same amount of dough in any other direction and still get them into the two pans the recipe claims you’ll need. We’ll chalk that up to my rusty geometry skills, too, and also ignore the fact that the dough at this stage tasted like used gum. Surely, a little oven time and some lemon glaze, and all will be well. I pop the three pie plates into the oven, and set about making lemon glaze: Lemon zest, lemon juice. Three cups of powdered sugar. I foolishly poured in one cup of milk and suddenly understood why it was being called “glaze” rather than “icing.” I hadn’t even used half the milk called for and found myself with a bowl full of sweetened lemony milk. Since the Pioneer Woman helpfully instructs the cook to “taste it and add a bit more of whatever it needs,” I added another two cups of powdered sugar, but still found myself staring at a bowl of opaque, lemon … well, let’s call it glaze. Perhaps if I’d followed PW’s instructions to the letter and added the melted butter to the glaze, it would have magically solved everything, but I was beyond humoring her at this point. When the rolls were nicely browned, I poured some of this stuff all over them, bit in, and noticed two things: First, they still tasted vaguely doughy, and second, the little glaze dribbles that had been sitting on the counter for 20 minutes had still not hardened even slightly. I hesitantly offered a roll to The Child. She spit it out and poured herself a bowl of cereal with no hesitation whatsoever. I’m not even going to try to be polite, she said, because you already know they’re awful. I resentfully ate a couple of rolls, and a few hours later had developed one of those headaches you get when your blood sugar crashes after having been too high. Lying down, waiting for it to pass, it dawned on me that it was a bit like the sleepy feeling you get after eating turkey, except that it hurt and the only thing I wanted to do with the leftovers was what I did. I threw them out. Last spring, when The Child was still in her meat-free, limited eating mode, we rediscovered cheese sticks. She tried one at a friend’s house, and discovered that she liked them. I was thrilled to add one more thing to the short list of things she would eat, especially one that could be easily tossed into a lunch bag. I bought some at the grocery store, they disappeared. I bought more at the grocery store, they disappeared. I went to Costco and bought cheese sticks. Lots and lots of cheese sticks. Then The Child got braces, and although cheese sticks wasn’t on the official list of Things She Can’t Eat With Braces, it didn’t take very long to discover that the little bits of soft cheese get stuck in the metal and aren’t very pleasant to eat with braces. This happened less than a week after my trip to Costco. And so they sat there, the cheese sticks, waiting for someone to make use of them. Occasionally a friend of The Child’s would come over and eat one, but more often than not, her friends have braces, too. After eight months of mostly sitting there, the Reg Dog joined our household, and when we began training him, we discovered that little bits of cheese worked well for training treats. So, I sliced cheese sticks in half lengthwise, and then into half-inch lengths, and trained the Red Dog with them. The cheese sticks began to slowly disappear, at a pace somewhat slower than glacial. The pace picked up briefly when the Feisty Girl lived with us. Her new owner seemed a bit perplexed when, the day he came to pick her up, I insisted that he take a large bag of chopped up cheese sticks to train her. He didn’t argue the point, though, in spite of the fact that he probably already had his own supply. Still I had a refrigerator drawer half full of cheese sticks, and though other foods came and went from the refrigerator, the cheese sticks lingered on. It seemed that, being labeled “cheese”, they should go bad, which would have allowed me to throw them out, but they never did. And, try as I might, I never could find an expiration date on their hermetically sealed packaging. We hit the one-year mark with the cheese sticks; I know this not because they finally went bad, but because the orthodontist told me. This is the time of year when most people are trying to figure out what to do with a excess of zucchini; my garden has produced exactly one zucchini this year, and I’m still staring down last year’s cheese. My zucchini plant is probably just trying to help out by not giving me any additional overabundance to deal with. Finally, though, I hit on the solution. What can I make that uses lots of mozzarella? I can use it all up in one night. So, I finally had a nice Saturday to myself, with nothing to do but pick blackberries, make jam, and while the jam and jars were simmering, let pizza dough rise. I used a simple recipe from Bobby Flay and learned a trick from watching the video: put pizza dough into a bowl to rise, and cover it with plastic wrap. 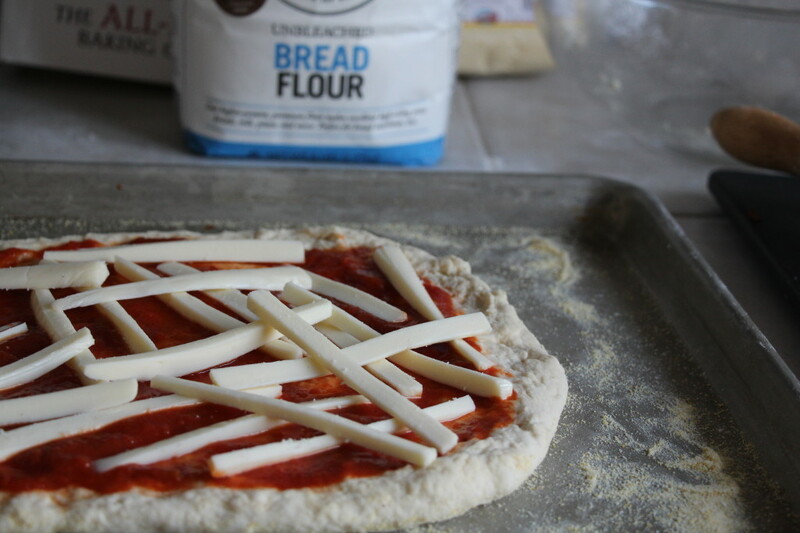 Use a marker to draw an outline of the dough on the plastic wrap. You will now be able to tell when the dough has doubled in size, since you can easily compare it to the original size in the outline. I was entranced by this newfound knowledge, and from time to time, stood there, watching dough rise. Eventually it was ready, and I heated the oven, and used some premade pizza sauce. For the first pizza I tried slicing the sticks thinly, lengthwise, figuring that as they melted, they’d form a nice cheesy layer. I put the pizza in the oven, and was surprised when, after about ten minutes, there was the distinct odor of something burning. The cheese sticks not only had not melted, they were turning black on their sharp edges. 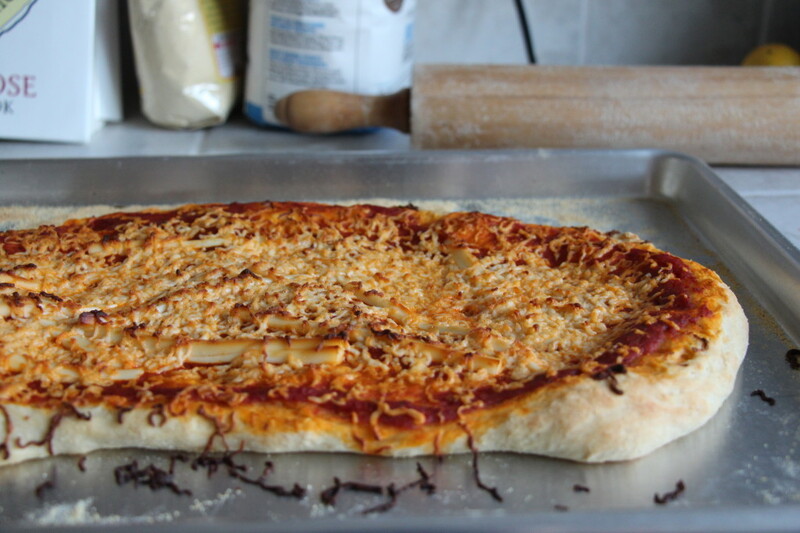 My mistake, I thought, so for the second pizza, I grated the cheese instead. This time, the cheese took less time to scorch in the oven, which was a bit of a problem as I needed the crust to finish cooking. I cut the pizza and The Child and I ate some, warily. She took hers into another room to eat while she read a book, but a few minutes later called out, Mom, it tastes just like Lunchables pizza! Well, that’s what I get for using “cheese,” I guess. There was some good news, though: The pizza dough, in spite of being very thick due to my inability to stretch it properly, was actually very good. The Child thought it was excellent, and sang about it: I like thick crust and I will not lie. But most important, after just one year, we’re down to the last two “cheese” sticks. Before you begin reading this post, please observe a moment of silence for the many sweet potatoes that gave their lives to make it possible. 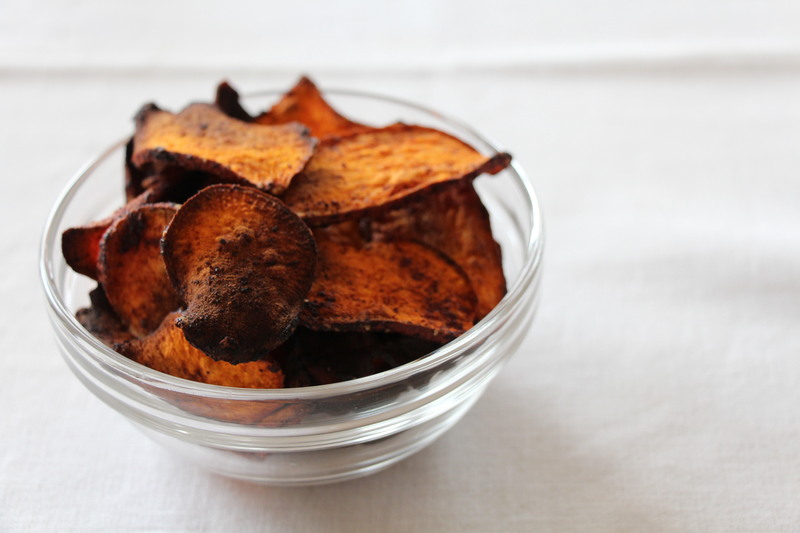 I found a recipe for Chipotle Sweet Potato Chips on The Minimalist Baker blog. As usual, I have no idea what I was looking for – not that, anyway – but I found it and it sounded delicious: spicy, sweet, crunchy, and oh yes, reasonably healthy. So, I wandered off to the local expensive all-organic supermarket to buy some first-class sweet potatoes and chipotle powder, and made a batch that very evening. So easy: slice, toss, and bake. Several things went wrong with the first batch, only half of which were my fault. First, the chips didn’t really crisp up, except for the ones that burned, which weren’t very pleasant to eat. Truth be known, the soggy ones weren’t that pleasant to eat, either, because The Minimalist Baker, she does like her spice – these soggy chips were seriously, inedibly spicy. They also looked nothing like her gloriously photogenic chips, and so I went back over the recipe, to find my mistakes. The first big mistake here was not flipping the chips halfway through the baking, as per her recipe. I recommend you don’t skip this step. Second, I managed to rub my eye and get some chipotle powder in it; I recommend you do skip this step. I tried the recipe again a few days later, and the only modifications I made were to cut the amount of spice (by nearly half! ), and remember to flip the chips after 20 minutes. The resulting chips were marginally more edible – at least, I didn’t feel like my tongue was going to be burned off by them – but I still had the same half-soggy, half-burned-to-a-crisp mix of chips. It occurred to me that the problem of sogginess might be caused by too much oil, so I decided to reduce the quantities of everything and try to get the mix right … one potato at a time. This approach worked much better, as the final batch was still quite spicy, but tolerably so, and I had only a very few chips that were slightly soggy – but only slightly, whereas the previous attempts had produced nearly gummy chips. I liked these chips and they were a great mid-afternoon snack – but only if you like things spicy. Even dramatically reducing the amount of spice resulted in a quite spicy chip – and there were still some that were, well, gummy. I adore gummy bears and gummy cola bottles but somehow I don’t see huge demand for gummy sweet potato chipotle anything. I tried slicing sweet potatoes by hand, but could not get them quite thin enough. Slicing them with the 4mm slicing blade of my Cuisinart produced mostly good chips. I tried a batch using the 2mm slicing blade and they were completely scorched at the 40 minute mark. Yes, I should have realized that cutting the chips thinner might mean I should cut the baking time. But I didn’t realize they would be quite this over-sensitive. Not only were they scorched, this batch also made my eyes water, so thick was the smoke in my kitchen. On the bright side, I found out that I need new batteries in my smoke alarm before there was an actual emergency. I tried one last tray of them in the oven, cut with the 2mm slicing disk (very thin), and then watched them like a hawk for the remaining ten or so minutes of cooking. 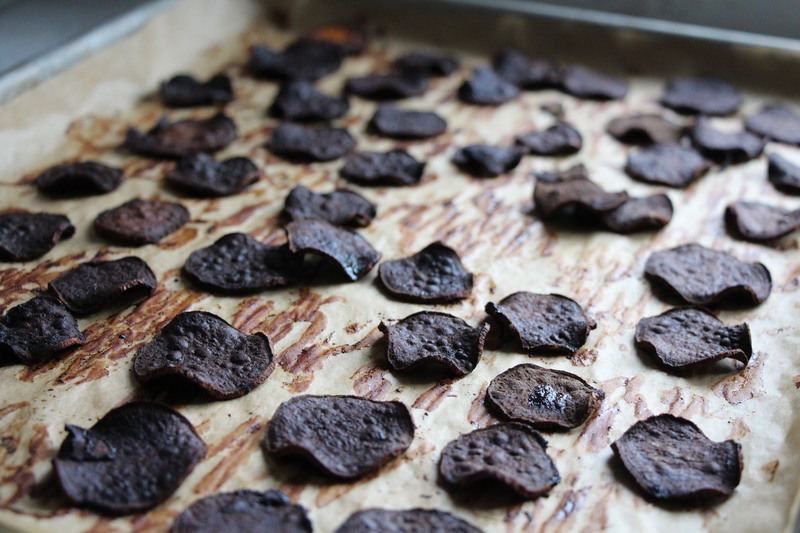 I removed chips as they started to get very brown on the other edges, and returned other chips to the oven. The most frustrating thing about this recipe is that it seems like it should work – and mostly, it came close on one batch (cut with a 4mm blade and pictured above). Pretty, right? And tasty, too. But honestly, this recipe was just so hard to get right that I finally gave up. If I want spicy chips, I’ll just pick some up at the overpriced organic supermarket. I haven’t given up on the idea of oven-baked chips, though: I do think this would work using something that scorches a little less easily than sweet potatoes. I’ll keep you posted. 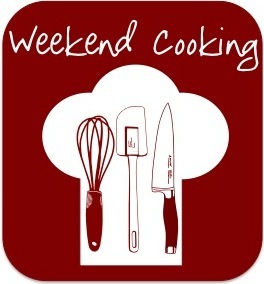 This is my contribution to Weekend Cooking, hosted by Beth Fish Reads. Why not swing by and see who had better luck than me this week?